Can’t sing? Sing the dialogues! Richard J. Clark is the Director of Music of the Archdiocese of Boston and the Cathedral of the Holy Cross. He is also Chapel Organist (Saint Mary’s Chapel) at Boston College. His compositions have been performed worldwide. HILE VISITING PARIS, I attended mass at Sainte-Eustache, a parish church. France has had a number of liturgical customs many that have endured for centuries. I expected to hear the organ voluntaries and improvisations during processions. One would not expect to sing hymnody with the same fervor as one may in the U.K. or in the United States. However, quite striking was the ease with which the congregation sang the dialogues. The congregation also easily sang Gloria VIII and Credo III in Latin – also an accommodation for the high number of tourists. It was obvious that the dialogues (as well as the Gloria and Credo) were sung week in and week out. For whatever reason, while there were no hymns to be sung, the congregation had plenty to sing. The dialogues were important. The 2007 US Bishop’s document Sing to the Lord: Music in Divine Worship (SttL) agrees: Dialogues and acclamations are the most important things to sing at mass. SttL is full of surprises! While we are pretty good at singing the acclamations during mass, the dialogues are terribly neglected, perhaps because it requires the willingness of the deacon or priest, and a music director willing to work with him. This is an extra step, but one that bears much fruit for the congregation, the liturgy. It also gives clergy and musicians an opportunity to work together. What if a priest or deacon can’t sing? Well, that hasn’t stopped many of them, and I believe that it is still very much worth it! Most recently, I played a mass at Boston College for a visiting bishop whose voice was perhaps much less than wonderful. During a weekday mass he sang the dialogues throughout. The congregation responded throughout. His voice was thin at times. The tones weren’t quite right or were just a simple recto tono. The Preface Dialogue was perhaps in the lowest key I’ve ever sung it. That stopped no one from full and active participation. ERE’S WHAT DID HAPPEN: the sense of prayer, reverence, and internal participation increased through this act of external participation. Neither one nor the other, it accomplished both. That’s what the dialogues do so well! A priest who sings both energizes the liturgy and fosters interior prayer. Furthermore, it bears repeating that one of the best ways to get a congregation to sing more is to sing the dialogues. Ironically, while we are addicted to accompaniments for security, congregations always sing better without it. One more interesting thing happened at that mass. The hymns seemed to be a little less important – certainly not to the point of exclusion as they were at Sainte-Eustache in Paris. 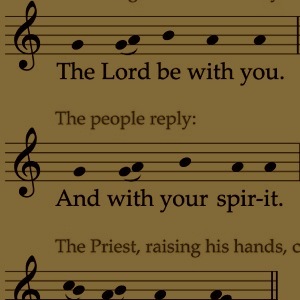 But by singing the words of the mass, hymns take on a different perspective. Singing the dialogues naturally lead to singing other things: the antiphons and psalms now make more sense. Hymns are no longer relied upon as the major point of external participation. Understand, as an organist, I love playing hymns and singing them. But singing the texts of the mass is considered most important for good reason, because the mass—not the hymns at mass—is our greatest prayer. Sing the mass! Here is a playlist of practice videos for the ICEL Chants which include the dialogues.